How can healthcare professionals and patients jointly strengthen the safety of patient records, so as to ensure that patients are protected against errors and misunderstandings in their record? The Patient Ambassadors, a part of WHO’s Patients for Patient Safety*, have prepared a number of recommendations for “safer patient records”. These recommendations have been prepared on the basis of a seminar – “Patient records, a healthcare working tool” – which was held 15 March 2018. The seminar agreed that the framework surrounding the patient interview is essential for a safe patient record. It is important to have this conversation in a safe and secure setting, including a suitable physical setting, and that mutual respect is displayed in the conversation. The outcome of the conversation will be best if both parties are well-prepared. The healthcare professionals are responsible for ensuring that the patient record is correct and adequate; however, patients themselves and their family members can help. 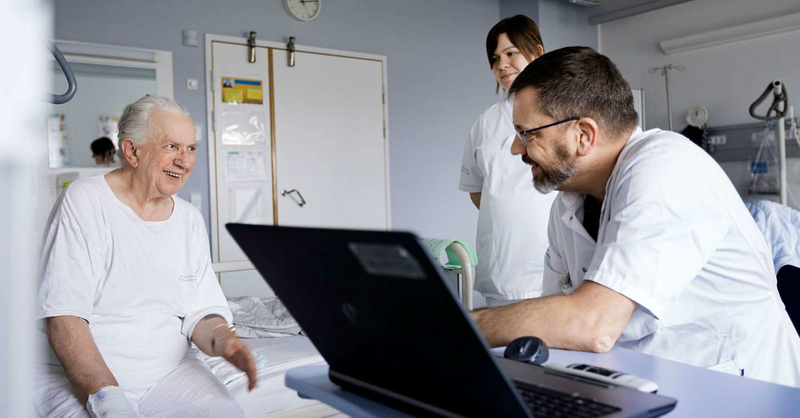 For example, as a patient or family member of a patient you may find inspiration in the material entitled: “Thanks for asking”, which can be found at https://godtduspoer.dk/ (in Danish). Furthermore, healthcare managers are responsible for making the right conditions available. These recommendations represent the thinking of the Patient Ambassadors as to how healthcare professionals, healthcare managers and patients each can contribute to a safer patient record. *Danish Patient Ambassadors are a network of patients and/or family members of patients who have experienced detrimental treatment in healthcare. This network was established in the spring of 2007 and forms part of an international Patients for Patient Safety network under the auspices of the WHO. When the patient has contributed to the contents of the patient record and agrees with what is written in it, the chances of a good treatment outcome increases. The good patient record reflects the patient’s wishes and needs. Why did I see the doctor? What did the samples show? If a diagnosis has not been found, which examinations have been planned, so that the diagnosis may be found? always ask the healthcare professionals if information is thought to be missing in the patient record, or if there are words or phrases the meaning of which is unclear to the patient. launch projects and trials, in which new, innovative patient record systems are tested and developed.